Ignore my hippy sign, I am a purveyor of delicious and surprising foodstuffs! 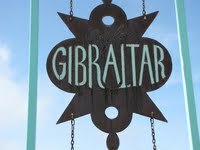 I think I might have had the best meal of my life last Saturday at Cafe Gibraltar. If you ever find yourself in Half Moon Bay, on Highway 1 about a half hour southwest from San Francisco (off Highway 92), you would be a self-depriving madman not to pay a visit. As my dining companions and I drove into Cafe Gibraltar’s parking lot, the fancifully shaped oxidized metal sign did not inspire confidence, looking more suited to a yoga center than the excellent restaurant we’d been told to expect. After walking in – and cutting through the distant glamor surrounding the Japanese-style seating along the back wall of the interior (my parents do not have the knees to sit cross-legged at low tables for a whole meal, and I’m pretty sure I’d have felt decidedly cramped myself), we were seated at a basic, comfortable table and given menus, which is when we discovered that the place touted itself as an organic Mediterranean kitchen. Looking over the appetizers, I was immediately drawn to the squid sauteed with garlic, cinnamon, and other North African aromatics I can’t remember now, but was still shocked by how unbelievably delicious the dish was. Toothsome, tender, and imbued with an uncommon depth of flavor via a combination of sweet and savory spices, it was the stand-out of the meal for all of us. After grilling the waiter some on the preparation, I had my suspicions confirmed: the pleasantly medium-sized morsels of squid had been marinated before cooking to break down some of the proteins that can make it an unpleasantly chewy food, then steamed briefly, then sauteed to pick up the various other flavors in the dish. Fish candy, I kid you not. Next up was the shrimp bisque that my Dad ordered. Now, I am not a huge lover of the stringy, meaty – if sweetly fresh-flavored – shrimp, but this soup was nothing short of a revelation. An sample menu I came across says it was seasoned with apples, sweet onions, dill and white wine. The gestalt effect was that some unheralded herb brightened the creamy, tangy puree – not to velvety, not too chunky – making the soup compulsively ladle up-able. My Mom and I also split a beet, feta, and Marcona almond salad. Though not ground-breakingly inventive, it was still one of the best iterations of this I’ve had. My parents each ordered a fish stew that they liked but couldn’t stand up to our stellar appetizers. I picked out a vegan dish – with trepidation in my heart, feeling vegans are often a pleasure-eschewing clan harboring eating disorders by a different name – of pumpkin dumplings with toasted pumpkin seeds in a spiced sauce. Again, it was the restraint of the seasoning – so bold, but so balanced, not only between sweet and savory, but also in terms of intensity of flavor – that made the dish knee-slackening. By this point in the night, I didn’t have much room left, so I took the dumplings home…and ate them for breakfast with a chai latte after a rainy scramble along a rock jetty the next morning: still so good. We are Balls, which means dessert happens. I got a glass of port (alcohol always wins over food by a nose for me, especially in the realm of sweets). My Dad ordered a maple tart with vanilla gelato and my Mom chose a tangerine sorbet. The tart was stupendously rich and flavorful, a classic truly taken beyond its roots: the tart was so buttery, it was as if only the bare minimum of flour required by basic chemistry had been added to prevent the thing from just melting into a bubbling golden mound in the oven. The tangerine sorbet was slightly sticky in that way I associate (positively) with homemade frozen confections. Even without dairy (I prefer the lactic middle ground of sherbet myself), there was something of the old school orange creamsicle in that sorbet dish – very satisfying and nostalgic.